In seven years of the sub-brand there's never been an M Performance 3 Series. Until now. 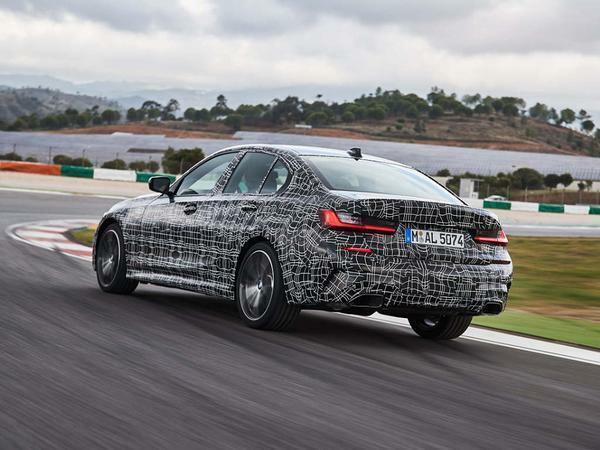 What about the new BMW 3-Series, then? You'll have read about it a fair bit already, I dare say. Worked out, too, what you think about the car's new look. If you've seen it in the raw, I bet you noted how big it is (fact of the day: the saloon's grown more over the last two model generations than it did over the preceding five - though they didn't put that in the press kit). Hell, you might have even downloaded a brochure and looked into the initial range of available engines (we'll save you the bother: 318d, 320d, 330d, 320i and 330i - with xDrive available, for now, on 320d only). Have you spotted the one potentially contentious omission, though? By my reckoning, this is the first time since before I was born (and I'm old enough to remember Zammo from Grange Hill and the original Mark Fowler from Eastenders) that there hasn't been a 3-Series on offer with a petrol-sipping inline six up front and drive exclusively at the rear. My, how times change. Sunrise, sunset, sunrise, sunset; cats in the cradle and the silver spoon; yes, we have no bananas; et cetera (I'd like to say my Homer impression is better in person, but it really isn't). What's more, there isn't a 3-Series like that coming either: not until the next M3 arrives at any rate (and there are some who think that might even go four-wheel drive). An oversight? Not in BMW Welt, I fear; and I reckon it could certainly set a few keyboards wagging in the PH forums. Silky straight-six engines and 'standard drive' have been about as central to the legend of the 3-Series as 'chocolate' and 'biscuit' have been to the much-celebrated, 43-year-old saga of the milk chocolate digestive (a disclaimer: milk chocolate digestives may or may not be older than, younger than, or the same age as the defining German compact executive saloon). The closest that the G20 3-Series looks to get to that time-honoured mechanical recipe might yet prove to be with the 330i M Sport: a car a couple pots shy of the required cylinder count under the bonnet, but that's pretty smooth-running and petrol-powered, and will be rear-drive-only at least for the time being. It'll also come with an optional electronic locking rear differential for those who can, shall we say, imagine a use for one. Equally, that nearest-match, old-school 3-Series we're after might be a 330d M Sport. Or it might be this: the range-topping M340i xDrive, which doesn't officially join the 3-Series showroom range until mid-2019 but was available to drive in prototype form at the new 3's European press launch t'other week. Track sessions only, they insisted; but by all means turn off the DSC and skid about as much as you like. Would have been rude not to, wouldn't it? So we did. With seven years now passed since BMW announced the sub-brand, it seems odd that there's never been an M Performance version of the 3-Series, which remains BMW's biggest-selling global model. Well, there is now. It gets all the suspension, steering and braking modifications that come with 3-Series M Sport specification (stiffer, shorter springs; uprated 'lift-related' passive dampers; stronger anti-roll bars; bigger wheels; bigger brakes with an increased pedal ratio; variable sport steering; more negative camber on the front axle). It also gets the aforementioned active torque-vectoring M Sport locking rear differential that you can pay extra for on the lesser Threes. It gets BMW's xDrive rear-biased four-wheel drive setup, too. And if you want to swap the passive M Sport suspension for adaptive, working through continuously controlled dampers, as an option, you can. But the main mechanical ingredient that makes an M340i an M340i will be its engine. A development of BMW's 'B58' turbocharged 3.0-litre straight six which has been in service since 2015, it makes 370hp and 369lb ft - so, healthy gains on what the outgoing 'F30' 340i made, and enough for bragging rights over your mate's Audi S4 Quattro. Not quite enough, however, for bragging right over your other mate's Mercedes-AMG C43 4Matic (as if anyone's out-bragging him). On Portimao's undulating circuit, this feels like a properly fast car, not a lesser sports saloon. It's got all the torque it needs to deal with a steep gradient even at middling revs, and it spins to the far side of 7,000rpm with enough ferocity to focus your mind and widen your pupils in any of the lower-order intermediate ratios of its eight-speed automatic gearbox. That's because BMW still makes world-beating straight six petrol engines, despite clearly thinking that we now prefer our mid-sized, mid-range saloons without them. This one gives the M340i a combustive smoothness and tonality all of its own. It sounds a little bit tougher and more naughty here than I remember the closely related 335hp 3.0-litre motor sounding in the Z4 I drove a few weeks ago but is much the better for it. When stood in the Portimao pitlane, I could easily hear BMW's M340i prototypes howling away through the farthest parts of the circuit. There's audible presence to spare here, and no mistake. And the car handles even better than it sounds. 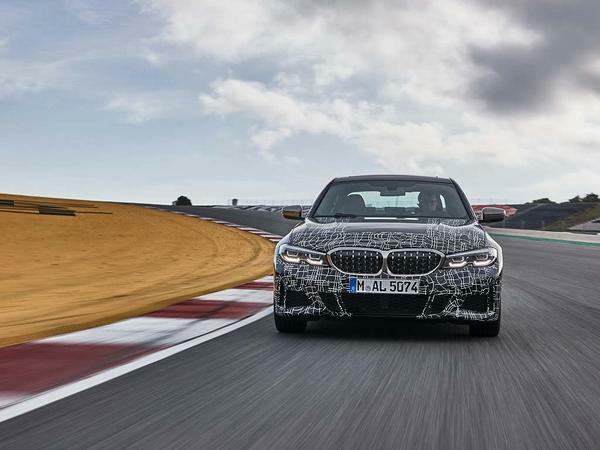 The seventh-generation 3-Series will be getting rave reviews for its flat, balanced, oh-so-assured-yet-agile chassis all over the internet today, and deservedly so. Well, the M340i just lobs up and smashes home every one of the standard car's absolutely plain dynamic advantages; at least, it seemed to on the basis of a fair bit of track driving, with very few flies left circling in the ointment. The first thing the car does brilliantly well is steering. The variable sport steering rack on the old 'F30' made for a stark comparison with the car's slower standard one, and Munich wanted there to be a bit less notional bandwidth between them this time around. And so the M340i doesn't steer that rabidly. It's got about 2.25 turns between locks. It feels constant and predictable, because this is just 'passive' variable ratio steering and not a speed-dependent 'active ratio' rack such as you get on BMW's bigger cars. It does a good job of communicating load on the front sidewalls. And it feels natural and intuitive to use, so you don't have to second-guess it in tighter bends. This might be the quicker of two setups, but it still seems calmer, more feelsome and more reassuring than the rack of the Alfa Romeo Giulia. So when you commit the M340i xDrive to a quick corner you do it with confidence - and with a more assured sense of stability that you might otherwise get, courtesy of that xDrive four-wheel drive setup. 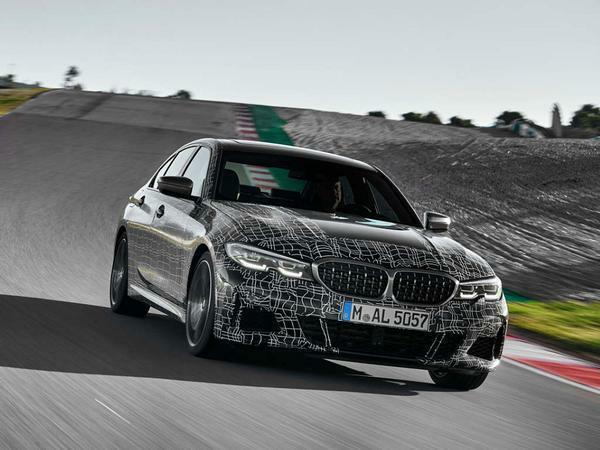 Not that you'd continue to be too happy about the influence of that driveline if it went on to dull the BMW's mid-corner balance, or to hamstring your options for the adjustment of cornering line and of attitude, of course. Thankfully, it doesn't do that; not at all. Once you apply about a quarter turn of positive lock, the M340i xDrive seems to take on the cornering poise and throttle-steerability of a simple rear-drive sports saloon. Deactivate the car's DSC and you'll find you can gas it up into a slide at will - and also keep it sliding with power and a bit of corrective lock dialed in, which is something most four-wheel drive performance cars decline to allow. Get beyond about a quarter turn of opposite lock, mind you, and the xDrive system does what four-wheel drive systems ultimately all do: starts feeding torque to the front wheels to bring the axles back into line - though it does it very smoothly and without any corruption in the steering. Even so, that needn't stop you having quite a lot of quite sideways fun in the M340i: and certainly quite a lot more than you imagined you might have in an xDrive BMW without a pure rear-drive mode. Will the car seem quite as brilliant on the road as it did on the track? Hmm: insert usual caveat here. 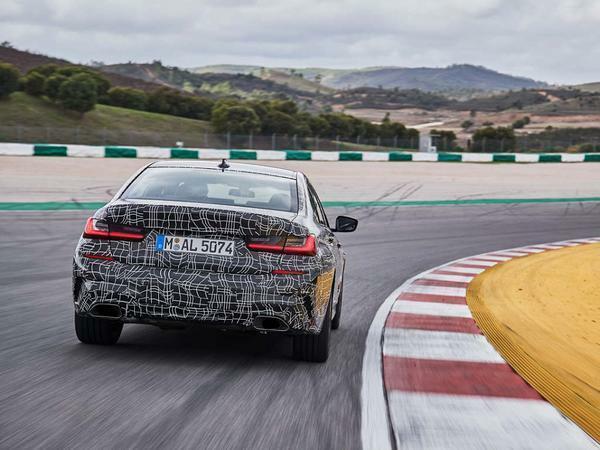 At times, our test car's optional adaptive dampers struggled to deal smoothly with a kerbweight that must be towards the upper limit of what the 3-Series' suspension was designed for. When given plenty to cope with on a bumpy B-road, they might not have all the answers. It also remains to be seen what the car's standard suspension setup is like, or its UK-market wheel and tyre specification for that matter. BMW M Performance models have tended to avoid the runflat tyre specification that has blighted lesser M Sport models these last few years, so there's reason to be cheerful on that front - but we'll wait and see. 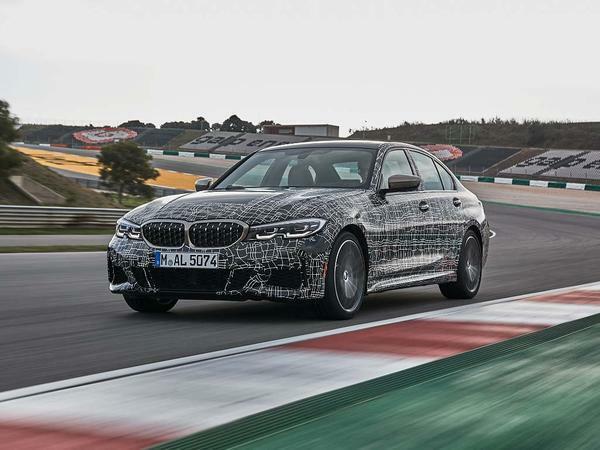 If the car's UK-road compatibility plays out well, there's every chance that those in the market for a really good fast 3-Series won't need to wait until Alpina or the M Division get around to working their usual magic on the G20 - because BMW may very well make a perfectly good one on its Munich production line. Better still, it may not be the only proper driver's car in the new 3-Series line-up. The signs certainly look promising - and one of them's an M Sport diff on a sub-£40,000 330i. In some European markets, like here in Switzerland, the outgoing 340i was only available with xDrive for some time. The M Sport Sound and Performance Kit was also available as a factory-fit option meaning that most of the later cars - like my Touring - had 360 PS / 500 NM. It will be interesting to see just how different the new car is to this 'similar' specification. Certainly on paper there seems to be little or nothing in the figures. The biggest complaint I have on mine is the understeer on snow-covered hairpins. I hope they fixed the weak chassis from the F30. Yes it was light, but it wasn't rigid enough to form the proper basis for the full-cream M variants and as a result the M3/M4 suffered numb steering and general lack of feedback through every touch point. The heavier competitors like the RC-F and AMG C63 were a lot better in that regard. If you can't make it light AND rigid, I suggest you make it rigid first and go from there; a rigid structure is a must for any true sports cars. It seems that the 3 series have gone back to their roots and brought driving pleasure as the central offering to its drivers. Could you qualify this statement please? I cannot find any info on the AMG C63? The figure F30 stands at 29300NM per degree and 40000 for the F80 M3, That’s more rigid than a carbon tubbed car like the Carrera GT. I test drove an F80 and one thing it didn’t feel like was sloppy or imprecise. Impressive little package there - and 370bhp isn't to be sniffed at. Shame though that the six cylinder petrol has disappeared completely from the range otherwise. It was what the 3 Series was famed for. Still remember the howling six pots form the E30s!